The final part of my holiday home tour is the kitchen. Thank goodness I took these photos before I began baking. Every year, my kitchen island gets a little Christmas tree. I fill it with kitchen related ornaments. I've been collecting ornaments for the past couple of years. I'm beginning to think I'll need a bigger tree next year! 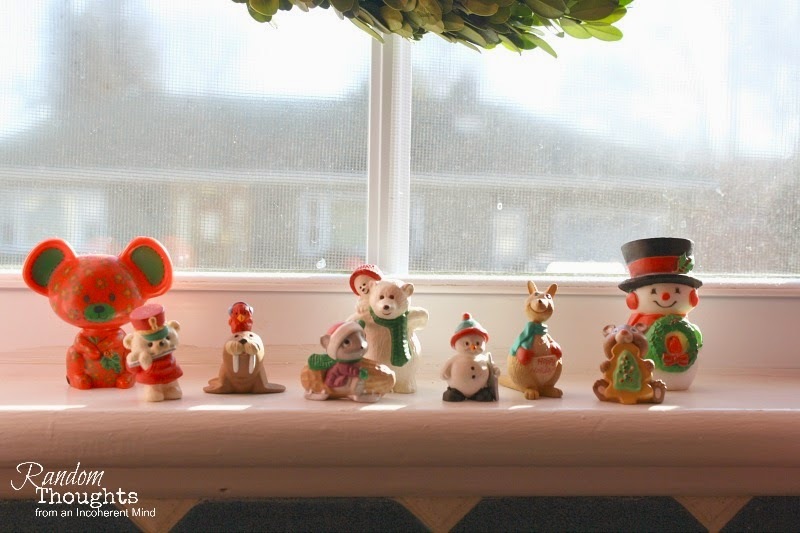 The kitchen window sill holds my miniature collection. Some of the little characters you see here were mine as a child. The others my husband bought me when we were newly married. I know they may seem silly, but I don't care because I think they're cute! I opened the doors so I could get a photo without the glare. I hope you enjoyed my Christmas kitchen today. 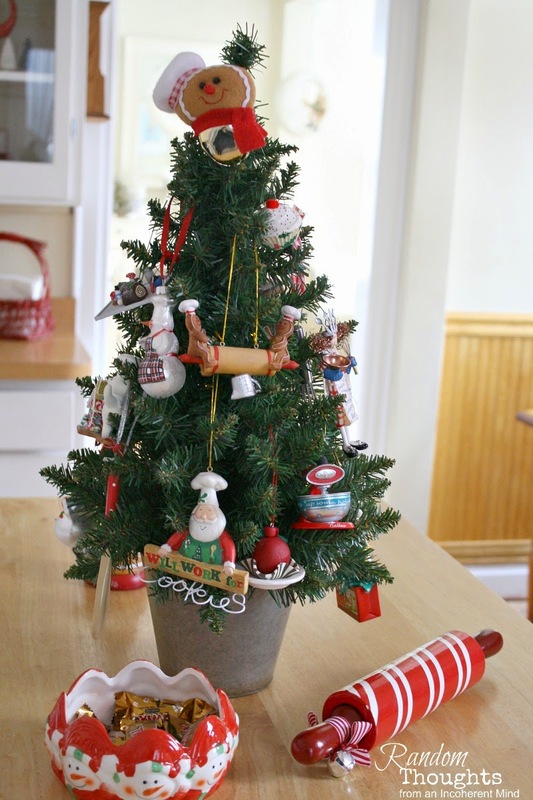 Love your little culinary kitchen tree! The Pillsbury Dough Boy is one of my favorites! Happy Holidays! 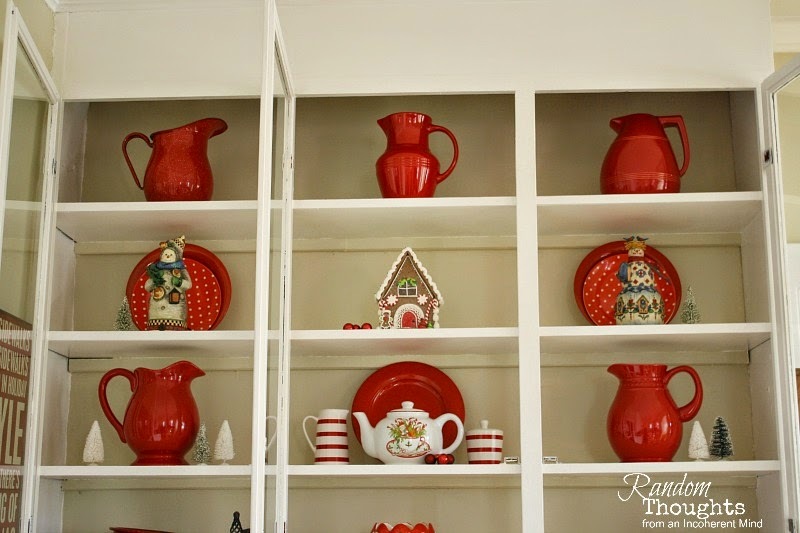 Your little kitchen tree is so cute Gina and I love all the red in your cupboards! Merry Christmas!! Gina, that rolling pin is just yummy! Wherever did you get it? What a beautiful kitchen tour. Your deep, deep reds just speak Christmas. I hope you have a wonderful, wonderful Christmas! I so enjoyed your kitchen tour, Gina. Your tree is so cute with all the darling ornaments, and I love your window ledge. Your shelves are filled with my favorite color! What a cheerful place to do all your baking and cooking. I also checked your entrance way and the suitcase filled with the nutcracker and other decor is just darling! Love your cute Christmas kitchen, Gina. I love the little tree with all the yummy goodies! Wishing you a happy and blessed holiday season.